The 1960s was the era of “The Great Escape” and “The Dirty Dozen”, WWII epics consisting of big plots and populated by big personalities. 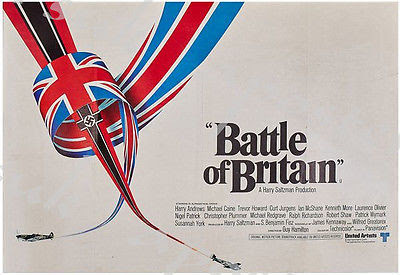 Guy Hamilton’s “The Battle of Britain” (1969) certainly possesses an all-star cast, ranging from Sir Laurence Olivier to a young Michael Caine and Christopher Plummer to Susannah York, the token female, though, frankly, every character here feels as superfluous as her, less people than variations of humans pushed around like pieces on the movie’s own battle map. They are in service to the plot, which, as the title implies, is big too, revolving around the RAF holding off the Lutwaffe and preventing Nazi Germany’s invasion of England. But while the movie’s production design aims for and achieves realism, employing so many actual planes at extravagant cost, the documentarian feeling does not extend to the storytelling particulars. If there is little human drama added, the details of the three month long battle are mostly just glossed over. No, this is a movie that went to great production pains, acquiring so many planes, IMDb tells us, that at the time of filming “The Battle of Britain” air force was the 35th largest in the world, and so much effort is exerted to show that air force off. The climactic air battle is one of the few sequences forgoing this defiant merriment, and, not incidentally, is when the movie is best, letting dialogue fall away to present something more akin to “Wings”. For the most part, however, the British, while occasionally allowed moments of gloom opposite the cocky, grinning Third Reich, like the self-impressed knaves of some ski slope comedy, remain generally plucky, like a scene when a parachuting RAF pilot lands in the backyard of the home of the family of a young boy who smilingly scurries out and offers the British hero a cigarette. No matter how few pilots they have, the British are still able to get planes in the sky, and seeing both the real-life aircraft mixed with models reminded me of how much I prefer tangible visuals to CGI-created ones. Tomato-Tomahto. Even so, there is something as distancing about much of “Battle of Britain’s” very real aerial footage as there is with the digital fake-outs of the modern era. The shots here are unimaginatively repetitive, whether they are dogfights seen from a distance, planes billowing smoke and going down, or explosions on the ground. Many years ago I attended a model plane re-enactment of Pearl Harbor in Ida Grove, Iowa with my Dad and a friend of his, and that is what Hamilton’s movie frequently looks like – a re-enactment from afar. As I watched “The Battle of Britain” my mind kept flashing back to another re-telling of storied British war history — that is, “Dunkirk”, directed by Christopher Nolan and released last summer. Like Hamilton’s film, “Dunkirk” was criticized in some quarters for not really having characters, just interchangeable people. And that is not necessarily inaccurate. No one is really fleshed out. But Nolan's intent was not to flesh anyone out, just to put the events on screen, which, despite muddying up with one of his patented dipsy-do timelines, he lent a palpable urgency. The scenes of Tom Hardy’s RAF pilot providing air cover are cleanly edited and amplified with immaculate sound design, rendering them thrilling in the moment, but then given added weight by being juxtaposed with the scenes on the ground, reminding you of the bigger picture. It is, you might say, artistic vision. The artistic vision for “The Battle of Britain” did not seem to advance much beyond the admittedly impressive production design. The eponymous event was titanic in human history, but on screen, it barely registers.